On 8 October, Poland and the US signed an agreement in Brussels on the stationing of warehouses in Poland to store US Army heavy weapons and military equipment. A statement by Polish Defence Minister Tomasz Siemoniak said that the warehouses will be set up in mid-2016. According to the Polish Ministry of Defence, the decision means that Poland is becoming one of the recipients of military aid from America’s European Initiative announced by the US President in Warsaw in 2014. Through the establishment of bases in Poland, the agreement enables America «to strengthen the allied presence». Warehouses for US heavy military equipment will be set up in Poland in five locations. «Poland has made the following areas and facilities available: an airbase in Lask, a Land Forces Training Centre in Drawsko Pomorskie, and military complexes in Skwierzyna, Ciechanów and Choszczno», said Jacek Sonta, spokesman for the Polish Ministry of Defence. Prime Minister Ewa Kopacz is assuring the Polish people that US military warehouses in Poland «will create many jobs» and help «strengthen NATO’s eastern flank», and are «the result of good relations with the US and a good response to what is happening in Ukraine». The Polish media is keeping quiet about the fact that NATO bases in Poland could pave the way for a military conflict with Russia, but the British newspaper The Times wrote about this last summer. At the beginning of October 2015, it became known that NATO is to open a centre in Poland to train counterintelligence officers, which, according to Poland’s Deputy Defence Minister Robert Kupiecki, «will establish a common doctrine». On 3 October, Poland signed an agreement with Slovakia on the creation of an allied centre in Krakow to improve counterintelligence. The first director of the centre will be a Polish officer of the Military Counterintelligence Service. The centre will organise joint exercises for the armed forces of NATO member states as well as work towards improving the common doctrine of these countries’ counterintelligence agents. «It is adding new allied capabilities to those that already exist in response to the threat from the east... I expect the first NATO officers to appear by the end of this year. We also envisage that the group of countries involved in the centre’s work will expand,» Kupiecki said. At present, it is expected that military counterintelligence agents from Croatia, the Czech Republic, Lithuania, Germany, Romania, Slovenia, Hungary and Italy will be involved in the centre’s work. At this point it is worth recalling that in 2012 alone, long before the ‘Ukrainian’ pretext for warding off the «threat from the east» made its appearance, 13 (!) 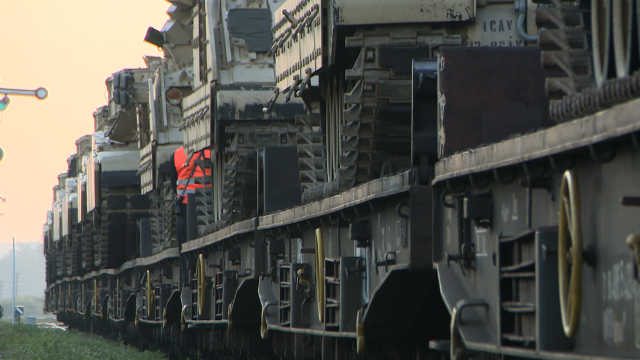 large-scale military exercises were carried out in Poland. More than 12,000 servicemen from Poland, the US, Germany and Canada were involved in the Anaconda manoeuvres alone in five Polish provinces at once. The manoeuvres were openly directed against Russia and Belarus: according to the legend, they were necessary to respond to the conflict caused by the actions of «reactionary regimes» and «energy expansion». In the autumn of 2013, Steadfast Jazz 2013 was conducted by NATO in the Baltic Sea region in Poland, Lithuania and Latvia. At the time, they were the largest exercises ever held in the alliance’s 65-year history. According to the legend, it was in response to a possible attack from Russia and Belarus. Today, the militarisation of Poland continues. As «proof of the threat from the east», Polish newspapers (Gazeta Polska etc.) are quoting, among other things, a statement by Ben Hodges, the commanding general of United States Army Europe, that «the so-called Suwalki Gap on the Polish-Lithuanian border is one of the two regions in Europe most vulnerable to threats». Citing the existence of Russia’s expansionist plans, NATO is continuing to redeploy the military alliance’s forces and equipment to the east through the countries of Central and Eastern Europe, and Poland is being given centre stage in this advancement. It should be emphasised that the process started long before the Russian Aerospace Forces’ operation began in Syria and even before the outbreak of hostilities in Donbass. It actually began immediately after the coup in Kiev. Some authors in the West such as Patrick O’Connor noted back in the spring of 2014 that the statements that followed «the US deployment of twelve F16 fighter jets and 300 troops to Poland earlier this month, underscore the brazen hypocrisy of the White House and its allies. Washington is now drumming up a war scare over alleged Russian troop movements within the country’s own borders, while at the same time the US armed forces are being deployed in a provocative effort to cordon off Russia from its neighbours». Immediately afterwards, Polish Defence Minister Tomasz Siemoniak announced on 22 March that Washington «should increase its [military] presence in Europe, including in Poland» and discuss the prospects of establishing a permanent US military base on Polish soil. In considering the reasons prompting Poland to act this way, it is impossible not to agree with the words of Western analyst James Petras, who says, that «the NATO seizure of Ukraine has a multiplier effect that reaches ‘upward’ toward Russia and ‘downward’ toward the Middle East and consolidates control over its vast oil wealth... The US has moved forcefully from encircling Russia via ‘elections and free markets’ in Eastern Europe to relying on military force, death squads, terror and economic sanctions in Ukraine, the Caucasus, the Middle East and Asia... Washington’s strategic objective is to isolate Russia from without, undermine its military capability and erode its economy, in order to strengthen NATO’s political and economic collaborators inside Russia». Poland: Presidential Election Goes to Second Round. Why Pawel Kukiz Angers Adam Michnik?